It takes less time to make a batch of Curried Cauliflower Rice than it takes to order takeout…and you won’t have to leave the house either. It’s a bold claim! But, I’ve got a tip that will put this recipe on your plate in less than 15 minutes. We’re in love with this versatile vegetable! From cauliflower pizza bites and cauliflower muffins to cauliflower grits, this powerhouse veggie turns your favorite dish into a low-carb, gluten-free dream come true. 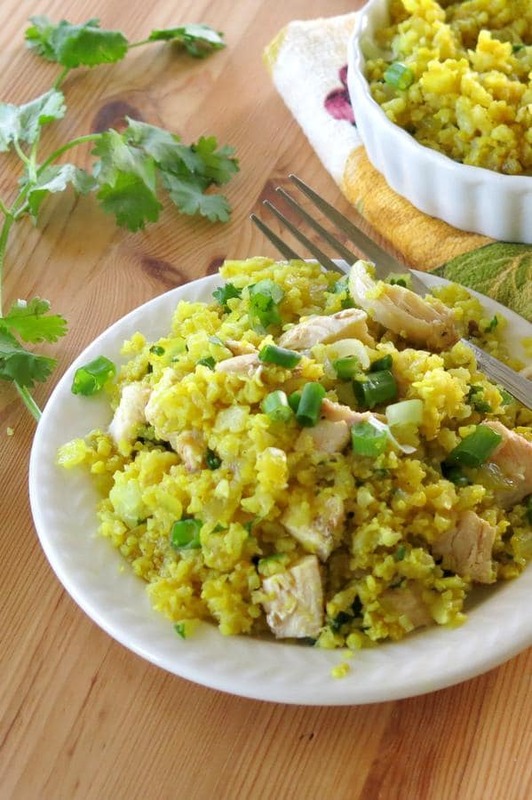 In curried cauliflower rice, the flavor is amped up with the addition of curry. There’s no need to head out for Indian food. This “rice” cooks up in minutes! Making cauliflower “rice” is sooo much easier than you might imagine. (I’m talking to all the naysayers out there who haven’t tried making this trendy “rice” before.) It might take 10 minutes the first time you do it. But, you’re going to fall in love with this one. So the second time you make it, I’m going with 5 minutes. And if you follow my big tip…no time at all. Here’s the process: Cut the head of cauliflower in half and cut the florets from the stalk. Drop them into a food processor. Pulse for about 60 seconds or until you have a consistency that resembles rice. That’s it. 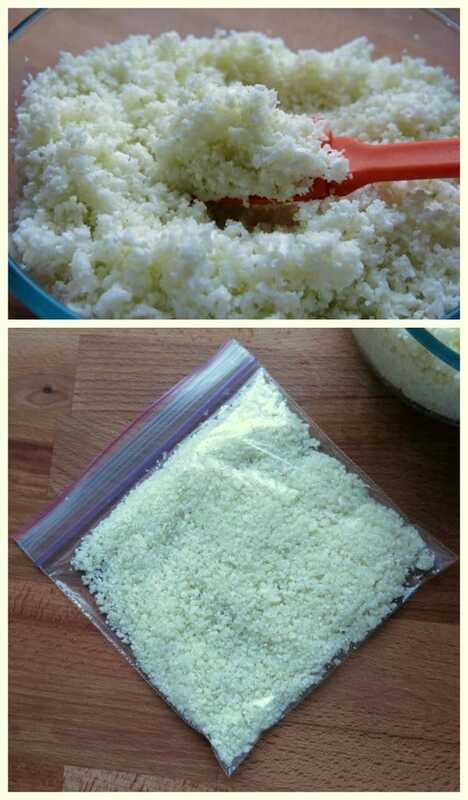 The Big Tip: Portion the rice and freeze it in plastic bags. When you’re ready to use the rice, simply pull it out of the freezer. There’s no need to defrost it. It doesn’t get any easier than that! You can even cook it in the oven from frozen as we do in Roasted Cauliflower Rice with Garlic and Parmesan. I can hear you now (or is that my family in the background?!) It’s not rice! Absolutely, 100% correct. It is cauliflower. But, this preparation has the texture of rice or couscous. There are so many uses for this preparation…ones that are particularly valuable for anyone avoiding gluten or following a low-carb diet. I became a fan with Easy Cheesy Cauliflower Pizza Bites. 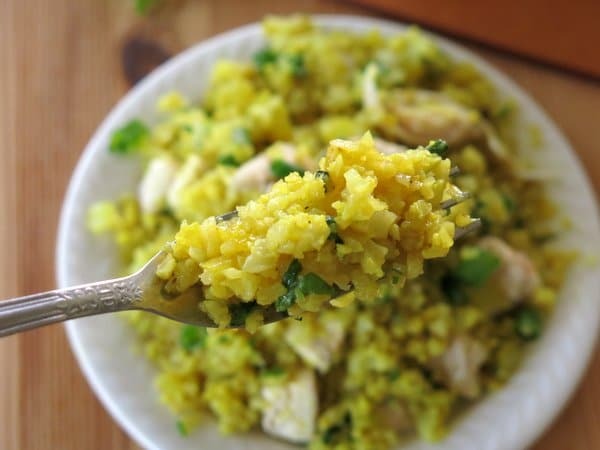 My absolute favorite way to jazz up cauliflower rice is with curried flavoring. Saute chopped onions and garlic for a few minutes, add curry seasoning, then the rice (frozen is fine,) cover and cook for about 5 minutes. Done! 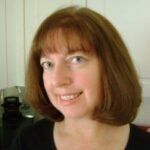 Fresh cilantro and green onion add more flavoring and eye appeal. Cut cauliflower florets from center stalk. Process florets in a food processor until they resemble "rice." Add onions and garlic and sautee for about 3 minutes or until onions are soft. Stir curry powder into onion mixture. Add cauliflower rice to pan and stir to combine. Top with green onions and fresh cilantro, if using. Depending upon the size of the head of cauliflower, the yield will be more than 2 cups of "rice." Processed cauliflower can be portioned into bags and stored in the freezer. I love cauliflower rice and I was making a big batch, storing it the refrigerator in a “somewhat” airtight container and then wondering why my fridge started to smell like a garbage truck. The gas that builds up can knock you off your feet. Freezing it is totally the way to go, I’ll be trying this next time! What a great idea for a side dish that’s different! It look so good, I’m going to try it! I’m always looking for new cauliflower rice recipes. Love this one! I’m a lover of cauliflower however the family is so picky when they can taste it. I always disguise and it works like a charm. This looks awesome! Thank you for the easy food processor tip in making cauliflower rice! Seriously, I have no reason not to make this… immediately! Thank you so much. I can harldy wait! I have to give this a try! And I just happen to have a head of cauliflower in the fridge right now. Sounds like dinner to me. I love cauliflower rice and I love curry! This is one of those dishes I would have a hard time sharing. 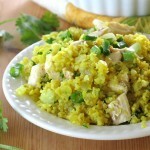 Marjorie-I love this curried cauliflower rice idea. I love curry that has cauliflower in it. But this is so much fun and I’ve got some chicken breasts marinated for tonight. This will be our side dish! 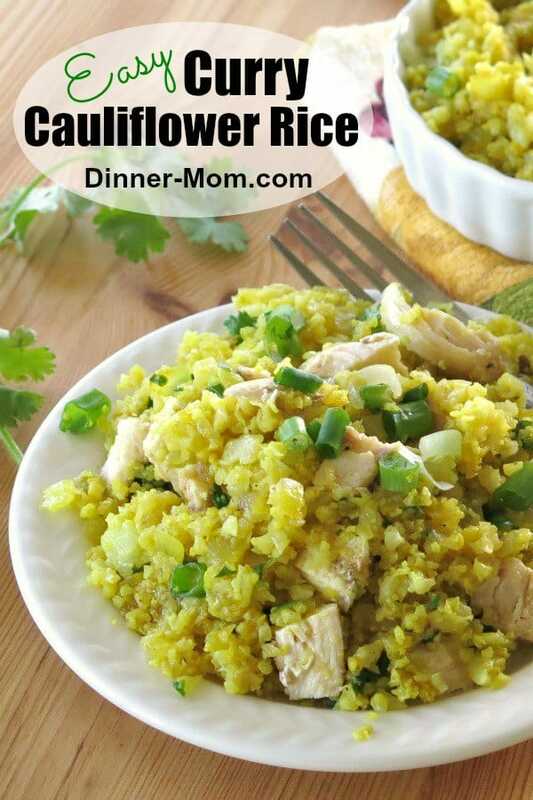 I’ve been wanting to try cauliflower rice for quite awhile now, and love the idea of adding curry powder to it! I really did not realize how simple cauliflower rice was to make. I’ve been wanting to try it for a while. I love that you’ve curried it up! I’m all about all things curried and in minutes! Yes. Yes. Yes. I love everything about this. The flavors, the health of it all and it looks so pretty. I can’t wait to try this! I haven’t had the op to try cauli rice as of yet…but you just made me want to! Looks so good! I have never heard of this and it looks amazing! I can’t wait to try it out! This is the first that I’m hearing of cauliflower rice. I’m so intrigued! Thanks for stopping by! So glad to help! Add to that, the time to wash, dry, and put away the food processor, mince the garlic, slice the onions, wash up the chopping utinsels, and you can DOUBLE that time. Tastes just as good leaving the cauliflower in small flourettes, and adding a dash of cumin. A little turmeric will yellow it up a little more, and looks better against the green cilantro. Thanks for your comment! and tip…it sounds delish. Once I drag out the food processor, I process as much cauliflower as I can for later! 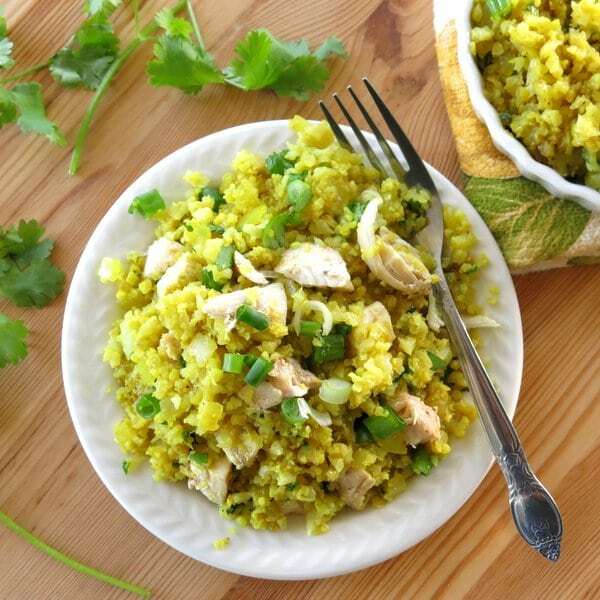 The title of the recipe is “Curried Cauliflower Rice and Chicken.” But there is no mention of chicken anywhere else. Whoops! Lol! Me too! Thanks for your comment! Ah, I added a little cumin and paprika, and some green peas. Just delish! MMMMMM I could easily go another bowl of it already! Yum! I often have to stop myself…because it can’t be good to eat an entire head of cauliflower in one sittin! Can it? I am so sorry you had trouble. I’m able to print, but will check with my programmer to see if there is a problem for a different type of computer set up.